Sen. Kirsten Gillibrand (D., N.Y.) vowed to oppose the appointment of retired Marine Gen. James Mattis to defense secretary under the Trump administration, arguing that the U.S. military should be led by a civilian. Gillibrand, ranking member of the Senate Armed Services Subcommittee on Personnel, released a statement Thursday revealing that she would oppose a waiver that Congress is required by law to pass to allow Mattis to serve in President-elect Donald Trump's cabinet. Military personnel who have not been separated from the military for seven years need such waivers in order to serve in senior defense posts. 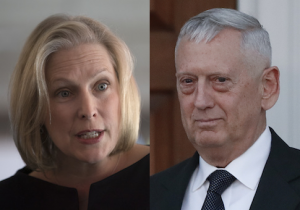 "While I deeply respect General Mattis's service, I will oppose a waiver," Gillibrand said Thursday, after reports surfaced that Trump had chosen the retired four-star general to lead the Pentagon. "Civilian control of our military is a fundamental principle of American democracy, and I will not vote for an exception to this rule." Gillibrand is a vocal member of the Armed Services Committee and has spent years crusading against the Pentagon's policies on sexual assault in the military. Gillibrand has repeatedly and unsuccessfully introduced bills to reform the way the U.S. military handles sexual assault, in the face of objections from the Pentagon. The Democrat has also been a strong supporter of the Obama administration's social policy changes regarding the military, including the decisions to open up all combat roles to women and allow transgender troops to serve openly as well as pay for medical care related to their gender transition. A report from the Washington Post said Thursday afternoon that Trump would name Mattis as his defense secretary, which was confirmed later by the president-elect himself at a rally in Cincinnati. Mattis has been cheered by individuals in both parties, defense experts, and former officials. On Friday, Robert Gates, who served as defense secretary under Presidents George W. Bush and Barack Obama, signaled his support for Mattis when entering Trump Tower in New York. Gillibrand could derail the appointment if she convinces other Democrats to vote against the waiver. The Democrat will require a vote at a 60-vote threshold to allow Mattis' appointment to advance, Politico reported Friday, meaning that Republican senators would need at minimum eight Democrats to vote with them to move forward on the confirmation. Gillibrand has unsuccessfully pushed legislation that would remove the decision of whether to prosecute military sexual assaults from the chain of command. The Pentagon has opposed the efforts, arguing that military commanders should be more involved in bringing sexual assault charges. Gillibrand's bill overhauling the military's sexual assault policies has failed numerous times over three years, most recently when she introduced it as an amendment to the Senate's version of the fiscal year 2017 National Defense Authorization Act. The chamber neither debated nor voted on the provision. Gillibrand was one of seven Democrats who voted against the annual defense policy bill, which is needed to authorize funds to support American troops. Earlier this year, Gillibrand accused the Pentagon of "blatantly" misleading Congress on military sexual assault figures, citing an independent investigation suggesting that the Defense Department misrepresented sexual assault cases involving service members during a 2013 hearing. When Defense Secretary Ash Carter refuted her accusations, Gillibrand was unsatisfied and demanded President Obama direct a formal and independent investigation into the matter. Meanwhile, Gillibrand has celebrated recent social changes to the military, while critics have said that the Pentagon under the Obama administration has prioritized making such changes over ensuring the strength of the military. For instance, Gillibrand celebrated the Defense Department's June rollout of its plan to allow transgender service members to serve openly in the armed forces, labeling the old policies "outdated and discriminatory." Under the new rules, the military will pay for medical care related to the gender transitions of transgender troops. Gillibrand also cheered the Pentagon's decision to open up all combat jobs to women last December, despite a recommendation from the Marine Corps to keep some frontline combat jobs closed to women. A comprehensive study by the service found that female members were injured twice as often as men in combat, less accurate with infantry weapons, and not as effective at removing wounded individuals from the battlefield. Gillibrand defended Ray Mabus, the outgoing secretary of the Navy, who said that the nine-month study was biased and ordered the Marine Corps to make all of its combat positions open to female service members against a request from former Marine commandant Gen. Joseph Dunford, now chair of the Joint Chiefs of Staff. Like Mabus, Gillibrand said that the months-long study by the Marine Corps was skewed. "All that we really know from this study is that groups that have the right experience and training—and more training—did better," she said during a hearing in February. "We don't actually have data that can be used because these women who were asked to participate did not have the same training and experience as males who have been doing it for a long time." Congress will need to pass a waiver before Mattis' nomination process advances and he can face hearings. The retired general's appointment has been warmly welcomed by many. "He is without a doubt one of the finest military officers of his generation and an extraordinary leader who inspires a rare and special admiration of his troops," Sen. John McCain (R., Ariz.), chair of the Senate Armed Services Committee, said in a statement. "General Mattis has a clear understanding of the many challenges facing the Department of Defense, the U.S. military, and our national security. America will be fortunate to have General Mattis in its service once again." "I've certainly been impressed with what I’ve seen and read about him and his reputation," Rep. Adam Schiff (D., Calif.), ranking member of the House Intelligence Committee, said Thursday evening. "So I think he's a very good choice, and I think he'll be very well received."